The story of ‘The Wonderful Wizard of Oz’ has a rich and varied past which is now over a century old! Originally a novel published in the year 1900, the story’s popularity scored worldwide success in 1939 with the release of the sensational full colour motion picture which to this day has netted close to $250,000,000! The story of Dorothy Gale’s mysterious fantasy land filled with magical locations, bizarre characters, danger and adventure has been inspiring literature, music, movies and games for generations. 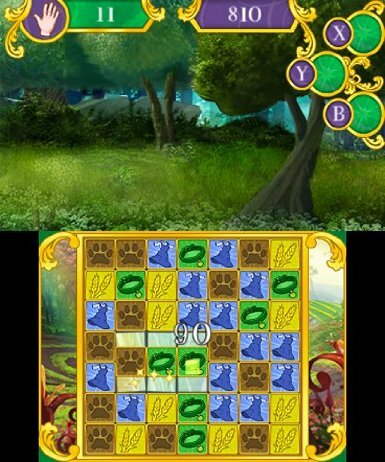 So the decision to take the licence from the recent animated movie ‘Legend of Oz’ and make a tile based puzzle game instead of an adventure or platform game demonstrates a complete lack of imagination. ‘The Wizard of Oz’ isn’t the only part of this conundrum sporting deep roots. The trend of block based electronic puzzle games began in 1984 with the release of one of the most addictive, important and best selling games of all time ‘Tetris’. The story of Tetris’s development, release and ownership is a frightening tale laced with tragedy & controversy which is well worth reading into. Tetris went on to inspire Sega’s 1990 hit ‘Columns’ which in turn inspired countless other games such as ‘Puyo Puyo’, ‘Bejewelled’, ‘Candy Crush Saga’ & now ‘Legend of Oz’. These games vary in quality and credibility, however the tile puzzle genre is far from past it. The story of ‘Legend of Oz: Dorothy’s Return’ is based after the events of ‘The Wizard of Oz’ and begins with Scarecrow summoning Dorothy back to Oz to deal with a new threat ‘The Jester’ who has set about taking over the kingdom. Dorothy is now back on a trek up the yellow brick road encountering new friends & challenges as she makes her way to the emerald city yet again. The gameplay itself takes place on the touch screen with the characters commentating on your progress on the top screen. Using the stylus you shift a sequence of tiles to create horizontal & vertical lines of three or more matching colours (you can also create L and T shapes). Creating these matching chains causes the tiles to break, awarding you points and replacing the broken tiles with fresh ones so you can keep going. There are 30 puzzles in total, the first being playable straight off the bat and the remaining 29 require unlocking. In each stage you have either a move limit or a time limit. Most stages have a move limit and as such they can be played slowly allowing the player time to assess the board and make strategic choices. Some stages offer unlimited moves but within a fixed period of time. Here it pays to play the game a bit more frantically, trying to break as many tiles as possible before the time runs out. For each puzzle you can win up to three emeralds depending on how well you do. In most cases you only need to win a single emerald in order to progress to the next stage, however as you get further towards the end of the game you’ll encounter areas that require a minimum number of emeralds in order to continue, so if you underperform you may find yourself having to do a bit of backtracking. Personally I didn’t mind backtracking too much as this game does include an experience system. As you break tiles you will build up experience points for specific characters (depending on the colour of the tiles that are broken). The more experiences points you earn the more power ups appear on the grid. These power ups can offer extra points when certain tiles are smashed, or create explosions on the board which in turn will destroy even more tiles and increase your chances of scoring longer combos. Since this is the case earlier stages become substantially easier to beat when you revisit them at a later date. Later stages can be a bit tougher to deal with as the game often adds obstacle tiles which need to be wiped off the board in order for your score to register. You could achieve a very high score but if one obstacle remains you’ll have no choice but to try again. Different obstacles have different properties so removing them from the board will require different techniques. Some items can be destroyed with power ups and some need to be crushed by getting them all the way down to the bottom of the grid. All that being said is the game any good? Well, not really. I personally found that this game did suffer from a couple of fundamental floors which debunked the entire experience. In the first handful of stages I found that regardless of how well I was playing the scores that I was achieving were very sporadic, and whether I passed a stage or not wasn’t a reflection of my actual performance. This is mainly due to fact that luck plays too high of a factor when trying to beat these stages. You can assess which moves to make in order to create a small chain, but to make a large chain you have to be lucky with which tiles fall to replace them, this is usually the difference between passing a stage and being stuck on one. Also because there are hardly any power ups available in the early stages and no obstacles to deal with the first half hour of gameplay is pretty dull and boring. In the later part of the game I noticed the second floor which relates to how easy it is to gain experience points, and how game breaking the bonuses become once you’ve fully levelled up. By the time I was half way through I’d become pretty powerful and as a result the game was becoming very generous with power ups, creating long powerful chains with little to no effort and eliminating any sense of challenge. If at any point you are still struggling to clear any stages (even after a prolonged grind) you can tilt the balance further in your favour by purchasing spells from the store. As you play you quickly build up a balance of yellow bricks which are used as currency. The spells you can buy offer a range different actions including allowing yourself more time & moves, scrambling the board, or a simple tile breaking tool which is useful for dealing with obstacles. The game’s presentation is also a bit of a wash out. The scenery, sprites & characters are all a little on the bland side and the music wouldn’t sound out of place in an elevator. The graphics are all drawn using a bit of a pastel / watercolour type pallet which lacks some of the vibrancy I’d like to see in a game such as this, but maybe that’s just a matter of taste. There were also a few tiny graphical imperfections such as scrolling clouds which didn’t quite join up. During play there are occasional sound bites however very little of the games dialog is actually spoken. Even if you were to forgive all the problems found here there is not enough substance to justify this title’s price tag which currently stands at £19.99 in the UK. If you want my advice go to the virtual console store and download the original Game Boy Tetris for £3.59 / $4. You’ll have a much more rewarding experience and have plenty of change to spare.